One of the world’s most captivating stories, the Ramayana, has inspired artists in India for more than 1500 years. The moral and epic struggles of kings, warriors, wives and brothers effortlessly traverse the worlds of humans, animals, gods and demons. In a special collaboration with the San Diego Museum of Art, the Seattle Art Museum will present an exhibition of art depicting scenes and heroes of the Ramayana. Visitors will follow the unfolding of the dramatic narrative, become familiar with its protagonists and learn the underlying philosophical and devotional meanings of the Ramayana in this presentation of nearly 40 paintings of stunning quality—many of which have never been shown before. 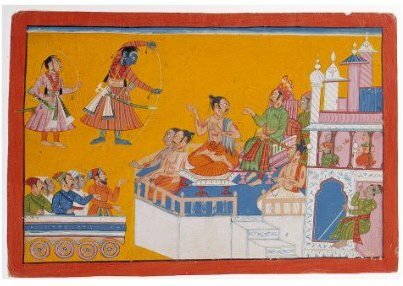 Representative works from a variety of regions, social classes and time periods reveal how artists depicted the same story in marvelously diverse means of visual expression, thereby testifying to the Ramayana’s timeless appeal. Many of the paintings are from the San Diego museum. A few were lent by Seattle-area collectors Elvira and Gursharan Sidhu. Wednesday’s opening celebration included a program in the auditorium featuring Gursharan, who explained how the exhibition came to be. It seems that for many years he has nurtured the idea of an exhibition built around the Ramayana. On comparing notes with someone in San Diego — I have forgotten the details — he realized they had enough pieces between them for a viable show, and that was that. An artistic transformation took place among women living in a cluster of villages in Bihar, northeastern India, once high-quality paper became available to them in the 1960s. In the Mithila region—the region that was home to Sita, heroine of the Ramayana—women maintained a long tradition of painting the walls and floors of their households with auspicious diagrams and deities. As women began adapting traditional imagery and painting new subjects on paper, the work in their distinctive regional style was seen outside their immediate environment for the first time. This exhibition of 30 paintings from a private collection includes works by 9 exceptional women artists from these villages. Their work became known in India’s cities within a couple of years, and connections to the international art world followed in the 1970s and 1980s. Their innovations and individual styles are introduced in the first grouping of art within the exhibition. Two groundbreaking series of narrative paintings are also featured: one depicting episodes from the artist Lalita Devi’s own life, and another series is by Baua Devi, based on a local legend of snake spirits (nagas). The progress of the artists’ work from this distinctive area—or “Land of Sita”—reflects some of the changes taking place in their lives and of many women elsewhere. Regarding the Sidhus, I found an interesting short piece in Apollo Magazine from six years ago about how they came to be collectors. Gursharan pinpoints when it all changed. At the end of the program, we all went back upstairs, where we were free to view the two exhibitions and to partake of food and wine. Taste, the restaurant in the Seattle Art Museum, catered an excellent Indian buffet dinner: rice, chicken on skewers, an eggplant dish, a cheese dish, a chickpea dish, bread, and baklava. We had been back from our east coast trip less than 48 hours, had not eaten dinner yet, and it was nearing 7:30 PM Seattle time, so we were well past normal dinner time and decided to start with the food. Next was a viewing of the women’s paintings. By the time we got to the Ramayana show, we were beat. We circumnavigated the one large room that houses all the Ramayana paintings, stopping at several pieces for closer examination, but ultimately decided we should return another time for a more thorough viewing when we had more energy. As we exited, we were treated to one of the great views Seattle has to offer, from the high point of Volunteer Park westward toward the Space Needle, the Sound, and the Olympic Mountains beyond. Dusk was drawing to a close, the western horizon washed in pink.